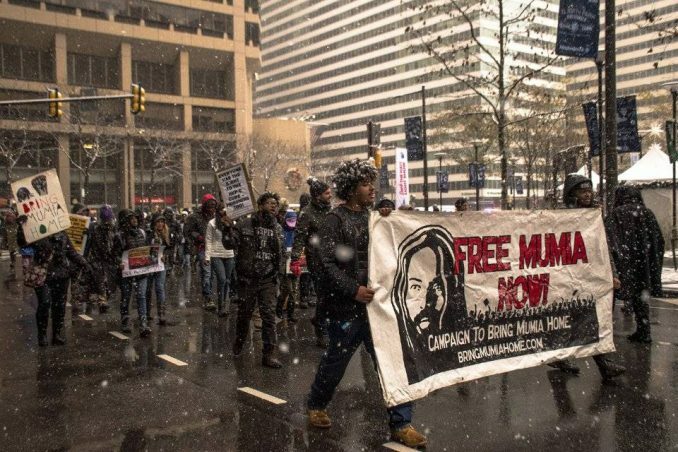 Philadelphia march for Mumia takes it to the streets, Dec. 9. Presentation of certificate for work on prisoners’ health care crisis. From left, City Council member Jannie Blackwell, Pam Africa, Akeem Browder, PA State Representative Vanessa Lowrey-Brown and Gregg Brinkley. 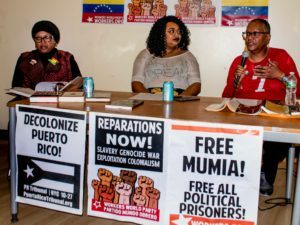 Philadelphia – “Have Black Lives Ever Mattered,” the title of Mumia Abu-Jamal’s latest book, was also the focus of Dec. 8 and Dec. 9 events here marking the 36th anniversary of his unjust incarceration. The weekend started with a teach-in at the Church of the Advocate, as Pam Africa kicked off the program with background and updates on the case. 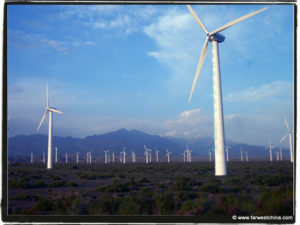 Africa is chairwoman of International Concerned Friends and Family of Mumia Abu-Jamal. Political activist and journalist Mumia Abu-Jamal was unjustly imprisoned and sentenced to death for allegedly killing a Philadelphia police officer in 1981. Abu-Jamal steadfastly maintains his innocence. 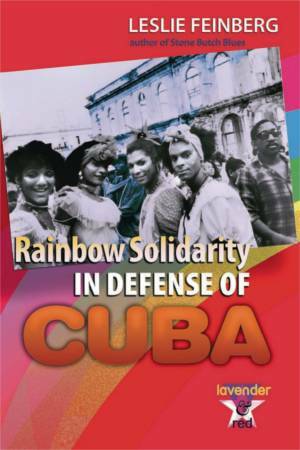 Thirty years later, in 2011, the global people’s movement forced the state to take Abu-Jamal off death row. Then the state re-sentenced him to life imprisonment without possibility of parole. After Abu-Jamal was diagnosed with hepatitis C in 2015, the people fought for and won treatment for him. However, he still suffers from cirrhosis of the liver and a painful, severe skin ailment. For prisoners, life without parole is a death sentence, especially when denied decent health care. With the assistance of the Pittsburgh-based Abolitionist Law Center, Abu-Jamal recently released a manual “to walk any person infected with hepatitis C through the obstacle course erected by medical staff and prison officials who seek to deny or delay” treatment. A panel addressing white supremacy came next. 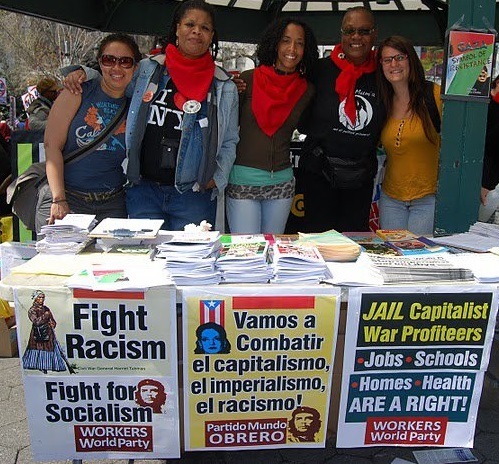 Speakers included Dr. Karanja Carroll with the Malcolm X Grassroots Movement and the National Black United Front; Candace McKinley, a Philadelphia Black Lives Matter organizer; Lamont Lilly, Durham activist, poet and 2016 Workers World Party vice presidential nominee; and Megan Malachi with Philly for REAL Justice. Discussion began with the question of how Abu-Jamal has influenced their work. A second panel focused on immigrant rights and international movements. Nancy Mansour, co-founder of the Palestinian support group Existence Is Resistance, discussed her film “Being Black in the Holy Land.” Colombian activist María Serna, with Lucha Pro Derechos (Fight for Rights), addressed the current crisis for undocumented immigrants. Mike Wilson, with Workers World, raised the hurricane devastation in Puerto Rico, where Wilson participated in a November work brigade. Earlier many people from the teach-in joined a Center City demonstration for Palestine, where Pam Africa spoke on the need for solidarity between oppressed communities in the U.S. and the people of Palestine. 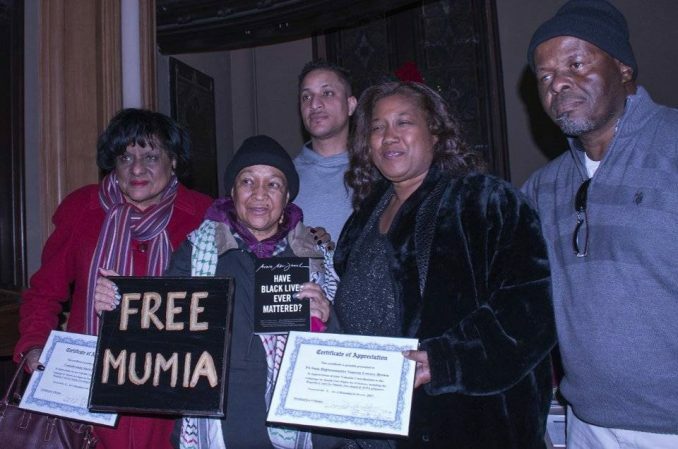 The next day, in wet, slushy snow, nearly 200 activists rallied to demand that Pennsylvania stop trying to murder Mumia. Demonstrators gathered at the statue of notorious former Philly mayor and head cop Frank Rizzo. The march continued around City Hall, stopping frequently for street rallies. Speakers urged people shopping in Christmas Market to join the rally for Black lives. At a newly installed monument honoring slain educator and civil rights activist Octavius V. Cato (1839—1871), speakers said recognizing Cato’s historic contributions is important, but does not answer the crisis for Black youth in seriously underfunded schools. Then protesters rallied outside the District Attorney’s office, demanding the release of all files pertinent to former DA Ronald Castille’s involvement in Mumia’s case. As a Pennsylvania Supreme Court justice, Castille refused to recuse himself from ruling on Abu-Jamal’s appeals. A 2016 U.S. Supreme Court decision, Williams v. Pennsylvania, was another death sentence case involving Castille. The court found that his refusal to remove himself was unconstitutional. In April 2017, Abu-Jamal’s attorneys filed an appeal for a new trial based on that decision. Lawyer Gayle McLaughlin Bartholdi’s memo to Castille in the files, dated March 27, 1990, allegedly exposes the former DA’s direct role in the case. Common Pleas Court Judge Leon Tucker, overseeing Abu-Jamal’s appeal, ordered the DA’s office to show cause why it should not locate and produce Bartholdi to present testimony regarding her memo’s content. It’s one item in the documents that the DA’s office says it cannot locate. Tucker has ordered an evidentiary hearing for Jan. 17. Demonstrators also challenged incoming DA Larry Krasner to keep promises made during his election campaign to reopen questionable former convictions. Krasner, claiming to oppose the death penalty, recently appointed Castille to his transition team, sparking strong criticism from many activists. The final Dec. 9 event was a forum on “Mass Incarceration A to Z.” Speakers included Akeem Browder, whose brother, Kalief Browder, unable to afford bail, suffered three years of abuse, including solitary confinement, during pretrial detention at New York City’s Rikers Island. Unable to recover from the impact of the abuse, Kalief died by suicide two years after his release. Browder is calling for the notorious prison complex to be shut down. Panelist Greg Brinkley’s nephew, Kevin Brinkley, was imprisoned as a juvenile in 1977 for a crime he did not commit. He was repeatedly denied parole because he would not admit guilt. Due to re-examination of juvenile life sentences, Kevin is being released, but remains subject to parole despite recent prosecutor’s testimony acknowledging a cover-up of evidence of his innocence. Writer and activist Marc Lamont Hill concluded the panel, discussing his own experience with the criminal justice system as a Black youth in Philadelphia and recounting being illegally stopped by police in New York. His credentials as a professor and a political commentator for CNN and FOX News did not give him immunity from police harassment. A program highlight was the presentation of certificates of appreciation to Pennsylvania Rep. Vanessa Lowery Brown and Philadelphia Councilwoman Jannie Blackwell for their work in bringing attention to prisoners’ health care crisis, including suffering from contaminated water in prison facilities.